For the last 40 years, most people believed the stock market always goes up. Simply buy and hold long enough, the theory went, and you could sit back and watch the money accumulate in your account. No thought or hard work needed. It was a nifty strategy — until the idea burned most investors in 2008. Almost a decade later, the scar tissue is still fresh for many investors. Even today, after the U.S. stock market has rallied by 271% since the bottom on March 6, 2009 — nearly tripling investors’ money — only about half of Americans are invested in the stock market, according to NPR. That’s down from two-thirds compared to a decade ago. The rest are in cash on the sidelines. Maybe that’s been you. Somebody’s made gains from all of those sectors in the stock market. It just hasn’t been Main Street. Dark money is the #1 secret life force of today’s rigged financial markets. It drives whole markets up and down. It’s the reason for today’s financial bubbles. On Wall Street, knowledge of and access to dark money means trillions of dollars per year flowing in and around global stock, bond and derivatives markets. I learned this firsthand from my career on Wall Street. My first full year working on Wall Street was in 1987. I wasn’t talking about “dark money” or central bank collusion back then. I was just starting out. Eventually, I would uncover how the dark money system works… how it has corrupted our financial system… and encouraged greed to the point of crisis like in 2008. When I moved abroad to create and run the analytics department at Bear Stearns London as senior managing director, I got my first look at how dark money flows and its effects cross borders. The “dark money” comes from central banks. In essence, central banks “print” money or electronically fabricate money by buying bonds or stocks. They use other tools like adjusting interest rate policy and currency agreements with other central banks to pump liquidity into the financial system. That dark money goes to the biggest private banks and financial institutions first. From there, it spreads out in seemingly infinite directions affecting different financial assets in different ways. Yet these dark money flows stretch around the world according to a pattern of power, influence and, of course, wealth for select groups. To be a part of the dark money elite means to have control over many. How elite is a matter of degree. These is not built upon conspiracy theories. To the contrary, alliances make perfect sense and operate publicly. Even better, their exclusive dealings and the consequences that follow are foreseeable — but only if you understand how the system works and follow the dark money flows. It’s easy to see how this dark money affects the stock market at a high level, because we can monitor its constant movement. The red line shows you how much “dark money” the Federal Reserve has printed since 2008. 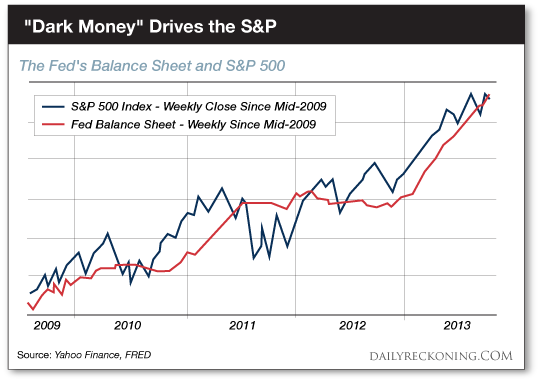 The blue line shows you the S&P 500. They move together — more dark money drives the market higher. Much higher. There are dark money charts from around the world, just like the one I showed you for the Federal Reserve and U.S. stock market. 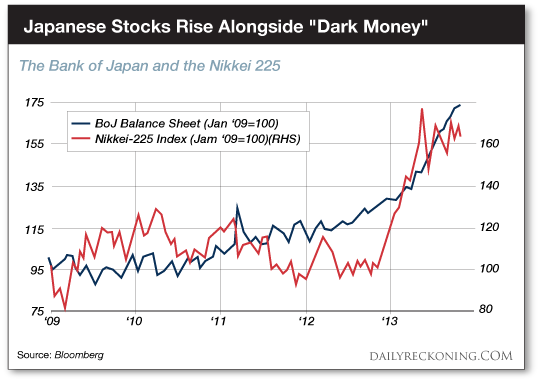 The blue line shows the dark money created by their central bank, The Bank of Japan. The red line shows Japan’s major stock index, the Nikkei 225, going up as well. The dark money drove the market much higher over the past eight years. 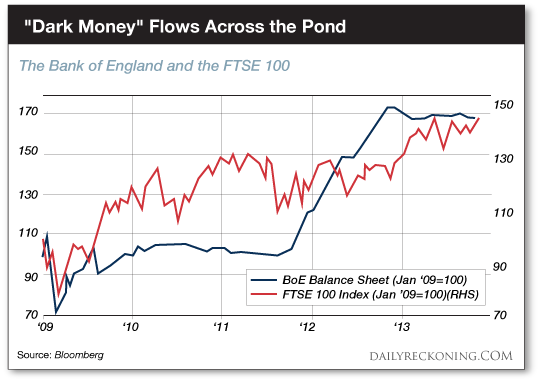 Again, the blue line shows the “dark money” created since 2009 by the U.K.’s central bank, The Bank of England. The red line shows how the FTSE 100, their stock index, has followed higher in lock-step. To invest profitably in financial markets, you need to understand the hidden power relationships that drive financial and political events. Ideologies and personal associations among elites are oblivious to political party lines and international boundaries. So is dark money.